Established in 1922, Gosford Quarries has been the name synonymous with sandstone in Australia for nearly one hundred years, and we’re widely recognised for our expertise in the quarrying and processing of natural Australian sandstone. 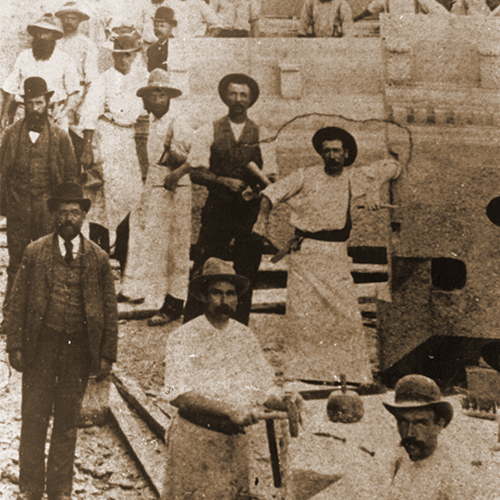 Our first sandstone quarry and processing plant was situated at Gosford on the Central Coast of New South Wales. The company, known as 'The Hawkesbury Sandstones Co.' produced the popular sandstone of the era, 'Gosford Grey', which was in high demand . Under the directorship of well-known local identity, Mr Henry Perry, the company rose to prominence from the 1930's until World War II. Following the end of the War, Gosford Quarries grew from strength-to-strength, building places of significance in Sydney and wider Australia. Sarkis Bros. Pty Ltd was established in Sydney in 1993 by four brothers; John, George, Issa and Kozhaya Sarkis. The Sarkis Bros.’ father, Antonios, founded a Limestone quarry in his homeland of Lebanon in the early 1970’s. It was only natural that his children became involved in the family business at a very young age, and whilst the other children were out playing in the soccer fields, the Sarkis boys were gaining life-long skills in stonemasonry. It wasn’t long before their knowledge was superior to that of the experts who frequented them for stone. In Sydney, Sarkis Bros. Pty Ltd had humble beginnings, where they starting out selling bushrock to nurseries, later working on small domestic projects with limited access to resources, along with fierce competition and scepticism from the industry. However, with faith in their Sandstone products and hard work, the Sarkis Bros. remained determined and united in their resolve to become a leader in the sandstone industry. Over the last 20 years, Sarkis Bros. has grown to become known as ‘The Sandstone Specialists'. THE MERGER BETWEEN SARKIS BROS AND GOSFORD QUARRIES WHICH TOOK EFFECT IN MAY 2014, SHOWCASES THAT THE AUSTRALIAN SANDSTONE INDUSTRY IS CONTINUING TO GROW AS MORE PEOPLE LOOK TO USE NATURAL AUSTRALIAN PRODUCTS. The merger has brought with it a variety of long-term benefits. Along with economies of scale resulting in better prices and more options, it has allowed us to introduce a broad range of specialised services such as in-house designers, heritage consultants, 3D modelling and highly trained personnel to provide an unparalleled level of service to the design sector. What sets us apart is how we assist our clients in enhancing their designs and ideas, even creating new ideas and designs for consideration, a complimentary service to help in improving profitability of a project whilst not compromising its integrity. Along with the fact that the merger has brought a combined 140 years of experience to the marketplace, our new Gosford Quarries management has assembled only the finest team that strives to provide our customers with confidence and peace of mind. To ensure the highest quality standards, we continuously test the stone to confirm the accuracy and currency of the geotechnical results and we make these readily available for all customers. As new business markets have evolved, so too have building designs and systems. At the new Gosford Quarries, we aim to lead the market through our state of the art technology and machinery. This has revolutionised the way we process our sandstone, opening up new possibilities for designers with sandstone now becoming a material of choice for fluid designs. With the merger, our continual investment in capital equipment has allowed us to surpass our previous environmental standards. Greater efficiencies in production have resulted in reduced wastage, which in turn is more environmentally sustainable. Not to mention Gosford Quarries’ power in salvaging stone from excavation sites which would otherwise have been destroyed. Making sandstone a more attractive solution to achieve “green values” is part of our ongoing environmental charter. Gosford Quarries continues to work closely with environmental and mining authorities as well as local communities to ensure that we play a key role in protecting Australian land for the future. Gosford Quarries is fast approaching one hundred years in business, proving that our products and services are more in demand now, as they ever have been before. We are constantly investing in State-of-the-art machinery and sophisticated technology to keep up with industry demand and expectations. Gosford Quarries is fast approaching one hundred years in business, proving that our products and services are more in demand now, as they ever have been before. Gosford Quarries’ stone is the most frequently specified sandstone by Australian architects, because we know and understand the capabilities of sandstone and offer the widest selection of colours and finishes. We stand by every recommendation we make because our regular testing of the sandstone allows us to make confident decisions. Our sandstone continues to be relied upon for many landmark projects across Australia from iconic heritage restorations such as St. Mary's Cathedral, Parliament of Victoria, The Australian War Memorial, Sydney Town Hall, Sydney GPO and Melbourne's ANZ Gothic Bank to contemporary design including Barangaroo Towers, Westfield Tower, Sydney Hilton and the Museum of Contemporary Art Sydney, just to name a few- our expertise transcends multi-disciplinary fields. More specifically in the Heritage and Restoration sector, Gosford Quarries embraces ‘continuity of product’ which involves using stone which matches the existing materials used decades ago. Moving into the future, we're focusing on opening even more showrooms and being readily accessible to the wider Australian market as we evolve to offer a greater range to suit all budgets. This year alone we have renovated and improved our civil and landscaping display at our Terrey Hills branch and have invested in new technologies which have helped reduce the cost of some of our iconic products. Our showroom boasts a wide variety of paving, slabs, cladding, landscape walling, ballast, billets, logs and many other popular sandstone products. We pride ourselves on our local products which fuels the Australian economy whilst simultaneously utilising our abundant natural resources. Being proudly Australian owned and operated, we will never compromise on quality by importing material or exporting labour, which in turn provides hundreds of job opportunities for Aussies. At Gosford Quarries, we invest millions of dollars into machinery which supports local employment, as we are forever dedicated to training apprentices and keeping stone masonry alive in Australia. This, coupled with our superior customer service and united team, means our customers can rest secured in the knowledge that Gosford Quarries is committed to each and every project, no matter the size.